Smiling is often thought of as someone being positive or in a happy situation. It’s true you are more likely to smile when things are going good. However smiling can give you a boost that could help create positive feelings even when you’re not truly happy. A smile can offer a variety of benefits one of which is Reducing stress levels. Smiling can lower heart rates during stressful times. Smiling is thought to increase serotonin levels. Serotonin is naturally produced stress reducer in the brain. Even a forced smile can help you deal with difficult environments better. Studies show that people who were smiling while watching a comedy TV show or movie were more likely to feel like it was funny. In contrast those with a no expression or frown where less likely to find humor. Now that you know how powerful your smile can be, it’s time to talk about any issues that are keeping you from showing off your bright smile. 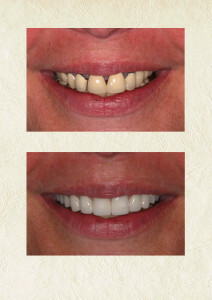 If you’re dealing with discoloration, gaps, chipped or missing teeth, or other cosmetic issues, you may be less likely to smile no matter what the situation. Take care of your teeth, so you can enjoy all the benefits of a healthy life, extending far beyond your mouth.